Track users even as they switch their browser and IP address! 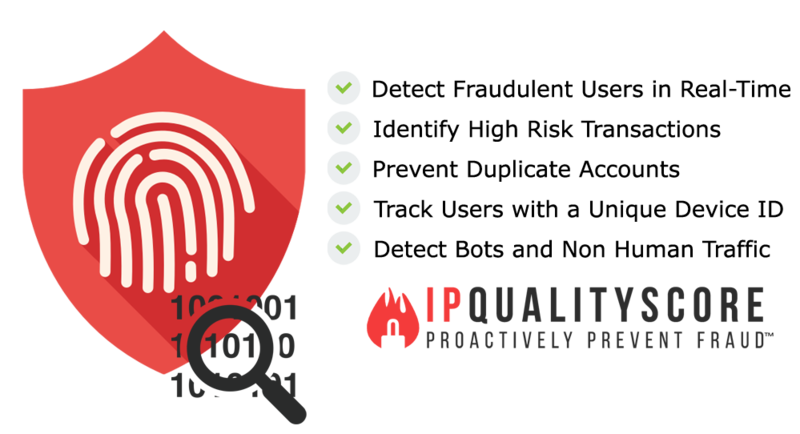 IPQS Device Fingerprinting tools are an unparalleled fraud detection service capable of detecting even the most advanced fraudsters and cybercriminals. Our system scans over 300 data points to accurately identify any irregularities in a user's online fingerprint that would indicate the user is intentionally manipulating their online signature, a strong signal that the user will engage in high risk behavior. Additionally, analyze user intent and behavior across our vast database of known patterns of fraud to identify bad actors with a high probability of engaging in malicious behavior. Track users even as they change their browser, IP address, and other identifiable settings which typically makes detecting duplicate accounts even more difficult, especially when abusive users are involved. Unlike proxy detection, this risk analysis searches deep into the user's online fingerprint, analyzing beyond their IP address and browser with machine learning and artificial intelligence. Traditional methods of catching low quality users are quickly becoming outdated as fraudsters continue to improve their levels of sophistication and techniques. Duplicate and fake accounts can account for up to 20% of some companies. Researchers are also estimating that over $200 billion in credit card fraud & chargebacks and over $16 billion in online advertising fraud are predicted for this year. These numbers are expected to rise even further in the next few years. Fraudsters are always looking for the next industry or service they can target to make a quick dollar. Our Device Fingerprinting service is an incredibly easy way to combat fraud and can be integrated in just minutes. How Do I Integrate Device Fingerprinting? A robust API suite is available to seamlessly integrate with your site, software, or apps. IPQS support team also offers free integration assistance 7 days per week as well as example code and simple documentation. Catch high risk users and suspicious transactions in real-time which can be blocked or flagged for manual review or even supplement your own real-time decision making process. IPQS Device Fingerprinting tools return a real-time fraud score indicating the likeliness of the user to engage in fraud, in addition to other data such as a super tracking ID, confidence score, location, device variables, and the connection status as a proxy, VPN, or TOR connection. We realize every site has different requirements for fraud detection, so our tools are flexible to provide custom anti-fraud solutions for any site or app. IPQS user dashboard makes it easy to create custom rules that modify how specific tests we perform factor into the user's overall fraud score. Additionally, custom blacklists and whitelists tailor the service to fit your audience. Track users as they move through your site, even as they change their browser, IP address, and other settings that could be used to identify them. Fraudsters routinely create duplicate accounts to engage in abusive behavior and will do everything they can to circumvent bans and suspensions on their existing accounts. IPQS anti-fraud tools makes it easy to identify these users and permanently block them. IPQS algorithms use a mix of artificial intelligence and machine learning to tailor fraud detection for your audience, while also learning from your history. Using real-time results, high risk users and fraudsters can be blocked or flagged for review - preventing chargebacks, click fraud, free trial abuse, and other abusive actions that can be time consuming to manually manage. Stop fraud before it can impact your business. Device Fingerprinting makes it easy to predict the user's intent and isolate high risk activity, mitigating any detrimental effects against your business. Every account has multiple machine learning algorithms & AI processes that learn directly from your audience, so your scoring accuracy is always being improved as more data is processed. This allows for a better user experience without false-positives. Experience the industry's greatest accuracy rates with over 10x less costs and service fees. Never pay for onboarding fees or early termination fees, you can cancel at any time. Automatically identify duplicate accounts, fake user data, frequent abusers, and other types of low quality users. Spend less time reviewing accounts and focus on more important tasks. Prevent all kinds of ad fraud including spoofed devices, emulators, residential proxies, device resetting, and similar types of high risk activity that produces click fraud and fake installs. Protect your advertising budgets and prevent low quality clicks from reaching your advertisers and partners. IPQS support team is always available for you, any day of the week including holidays. We can additionally assist with the integration process, making it as effortless as possible for your team. You'll always have a human point of contact that you can reach out to.